Containers. 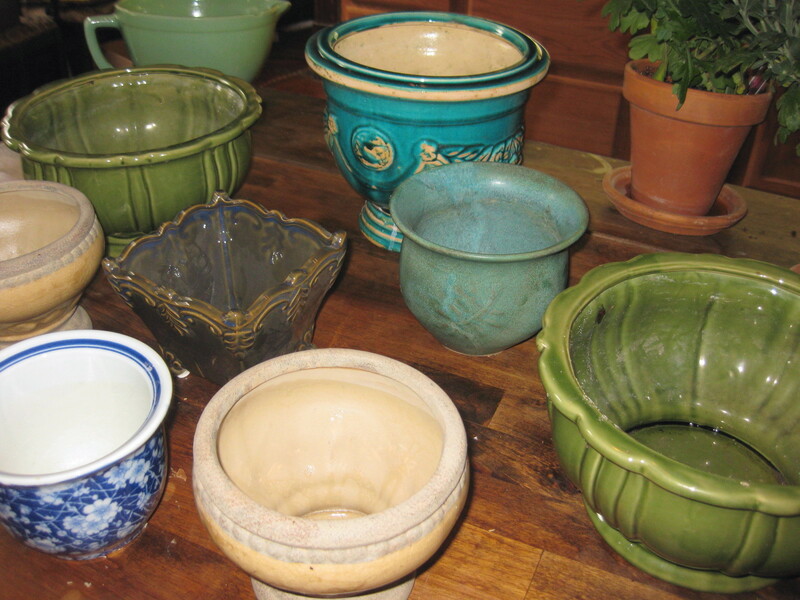 You can grow narcissus in all kinds of decorative bowls and vases, and even kitchen items too, like coffee mugs (one bulb per mug) and Bundt pans. The important thing is that containers be deep enough, preferably 4-5 inches, to permit enough pebbles to be spread under and around the bulbs, and thus give support to the big root masses which develop. Planting. Fill a container 2/3 full with polished aquarium pebbles (my first choice) or some other clean aggregate, and then arrange the bulbs on top. Odd groupings of three, five, or seven bulbs make the most attractive displays. Next, add enough water to reach the base of the bulbs. Then sprinkle another inch or two of pebbles between and around the bulbs, until only their pointed tops are exposed. 40-Proof Paperwhites. 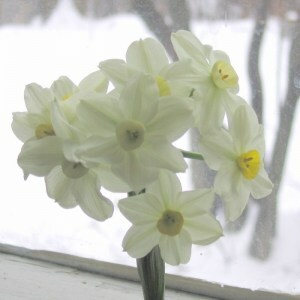 To keep these narcissi from growing too tall (unstaked, they collapse in a miserable heap just as their flowers open), give them a shot of gin: after planting, set the bulbs in a light or sunny window for exactly one week. Then pour the water off, and replace it with five parts water to one part gin (or vodka — any liquor that is 40-proof will do the trick). This booze-and-water-business really works. The plants grow to half their normal size, but with flowers just as large and fragrant as usual. As evaporation occurs, I always replenish the bulbs with the same gin-mixture, to a level that just touches the base of the bulbs. Varieties to try. Although most garden centers sell the standard ‘Ziva’ paperwhite, there are other varieties worth trying. I love ‘Ariel,’ above, and also ‘Nir’ for their musky-sweet scent and high bud count (both produce more blooms that Ziva). ‘Inball’ and ‘Winter Sun’ are not musky, just sweet. ‘Winter Sun,’ above, in my parlor window with a background of November snow, features a creamy yellow cup framed with sparkling white petals. ‘Inball’ is completely white. One very pleasant aspect of paperwhites is that unlike Dutch bulbs, they do not require chilling. Nor do they demand an inordinate amount of sunlight. Mine bloom unfailingly in east and west windows, where they receive just a few hours of weak winter sun. I think you will find, as I have, that these tropical travelers are the easiest of all bulbs to force for winter color and perfume. Their beauty is both breathtaking and guaranteed, providing you start with quality stock. I order my bulbs from a specialty-dealer. The nearer bulbs are planted to their natural bloom time, the sooner the flowers emerge. For Thanksgiving bloom, be sure to plant the bulbs in mid-October. For Christmas fragrance, make your planting the third week of November. Plantings made after New Year’s Day usually bloom in only 3 weeks’ time. Think you’ll plant paperwhites this fall? Well, I certainly hope so! 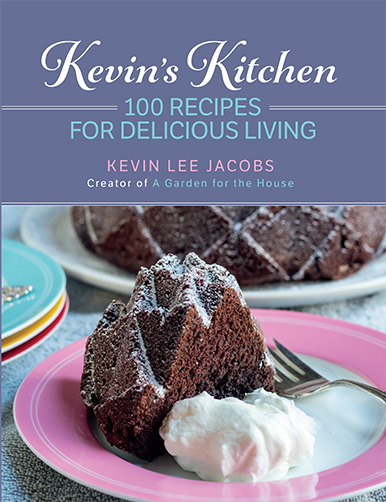 Don’t miss anything at A Garden for the House… sign up for Kevin’s weekly newsletter! Kevin, when you wrote about this “gin trick” last year, I followed your advice. 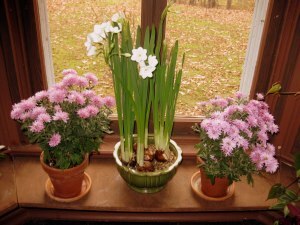 Yes, it really works, and I love my “house size” paperwhites! Can I give them white wine? I don't have any hard liquor here (usually). Yolanda – keep the wine for yourself. The sugars in wine (and in beer, too) can damage the plants. Would this work for freesia? I am planning to force them in water and pebbles similar to the ones in your photos. Btw I love love love your blog! I am so glad I found you. Merry X-Mas! zehra – welcome! You can add alcohol to narcissus paperwhites, but I do not recommend alcohol for freesia. I grow my own freesia bulbs in soil. In any event, do let me know when your freesia blooms — I think it has the most remarkable fragrance in the world. And, a Merry Xmas to you, too! Congratulations for your wonderful indoors garden and web site, and thank you for your excellent advice and beautiful photos. I followed your step-to-step guide for forcing freesias and they are coming along beautiful. I planted them late, only in early December, but now they are already about 8” in length. I also have paperwhites, hyacinths and amaryllises among other plants indoors, and some beautiful spring surprises waiting to burst into action on my balcony. I have a few questions for you regarding the bulbs that have been forced indoors. Is it at all possible to rescue paperwhites bulbs after they were forced? I feel so sorry that I may have to discard them and I would love to give them a chance to bloom again. How can I do that? Also, I see that the paperwhites flowers form seeds. Did you ever use these seeds, and if so how and when? 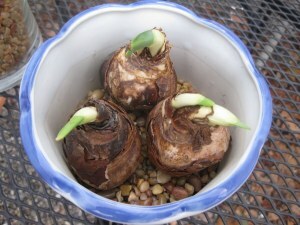 If I understand it correctly, forced hyacinth bulbs planted outside will bloom again in a few years. But when shall I plant them outside, when the weather is warmer or after the flowers have faded? What about freesia bulbs? Can they flower again? Thanks again for all your great advice. A Happy New Year to you and to your beautiful garden! Dana – nice to meet you. Paperwhites can bloom again, but only if you have forced them in soil (not pebbles and water), and only if you provide them with food and plentiful sunlight after the blossoms fade, as for tulips. Yes, you can start paperwhites from seeds. But keep in mind it will take up to three years for the bulbs to reach flowering size. Of course hardy bulbs (tulips, hyacinths, daffs, etc. ), if they are forced in soil, can bloom again. Just follow these directions. I have not grown paperwhites nor freesia outdoors. That's because they are only hardy in zones 9-11 (I'm in cold zone 5-b). Stay in touch — and do let me know if you have any other questions. Dana – Yes, bulbs forced in cocopeat can be saved. Start feeding them when their flower stalks emerge. I feed mine with every watering, using a 1/4 teaspoon of either high-phosphorous or all-purpose formula, dissolved in a gallon of water. Cut off faded flowers, but let the foliage remain. Keep the plants in full sunlight until the foliage turns yellow. Then withhold all water, and set the bulbs someplace cool, dark, and dry. 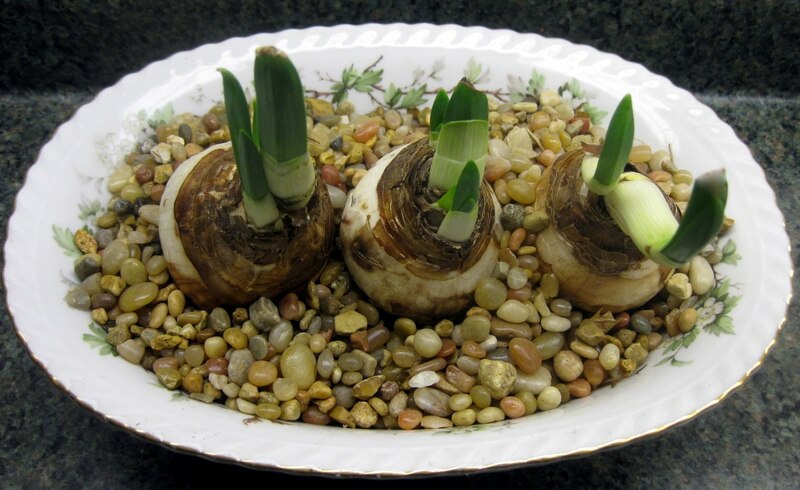 In October repot the bulbs in a fresh soil mixture. Hardy bulbs, of course, can be given a position in the outdoor garden. I'm so glad you share my enthusiasm for bulbs! Kevin – Thanks so much. This is great news! I will do as you suggest. And, yes, your enthusiasm for indoors gardening is contagious! Please, keep up the great work on your site for all of us to enjoy. Best regards, Dana. I always plant paperwhites in winter, but usually end up staking them. Didn't know you could keep the flowering stems small by boozing up the bulbs. Great tip! Kevin – I almost have my selections down been talking with Kathleen and getting lots of suggestions and ideas….I am so glad you did this step by step because I am going to do paperwhites as my first try sounds like a recipe for success…..
You have such a FABULOUS newsletter I enjoy it so much and I will be sure to send you pictures of my sprouting bulbs in the springtime. Sheena — Thanks for the kind words. When it comes to bulb-forcing, Paperwhites are a great place to start. As for the other bulbs you select — do send photos in spring in your are able. Would love to see them. Hi, I love your web site – a propos paper whites, I live in South Florida and planted paper whites outside many years ago. They produce a lot of green stems but I don’t always get flowers. Every year they multiply and it is a great mystery why some years they make flowers and some not. We thought it had to do with the cold (we don’t get a lot of cold weather here) but some years it has been very chilly and still they didn’t produce flowers. Some other years it has been mild and we get flowers. It has been two years now since I haven’t seen any flowers but they keep producing. Do you have any advice for me? The flowers don’t last very long either so it is a real treat when we see them. I do have thousands of gorgeous pink rain lilies in the summer that makes up for the disappointment of the paper whites! Cherie – Pink rain lilies — I’m swooning! You might like to check my post First Aid for Non-Blooming Daffodils. Paperwhites and daffodils have similar wants, as they both belong to the Narcissi family. Hi Cindy – I don’t know why your outdoor-planted paperwhites aren’t blooming. The bulbs might need to be divided. Or, perhaps they need food. More details here. In any event, if the bulbs are healthy, and there is an embryo flower within each one, then yes, you can dig them up and force them indoors. 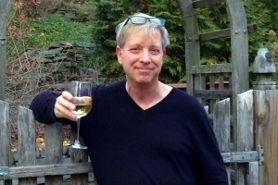 The alcohol trick really works — hope you’ll give it a try! Hey, Kevin, thanks for this tip. I LOVE paperwhites: they remind me of my great-aunt Weah who loved her yard and all her plants, grass, and trees loved her right back. It seemed to my child’s mind she always had plants blooming in her yard. 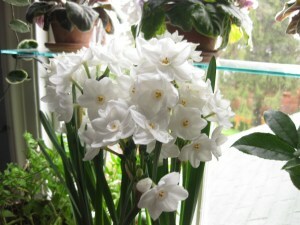 Can these narcissus be planted to bloom outdoors in their natural cycle after forcing? Thanks for all your good tips and good cheer! Hi Kate – I would have loved your great-aunt Weah. Paperwhite narcissi are normally hardy only in zones 8-11. If you live in a warm zone, you can certainly save the bulbs you’ve forced indoors for future planting outdoors. BUT…be sure to force them in soil, not pebbles and water. Water forcing exhausts the bulbs to the point where they are not likely to bloom again. Also, keep the bulbs watered and fed until their foliage dies back. 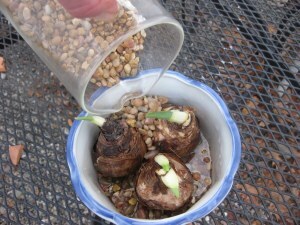 Then let the soil dry out, and store the bulbs someplace cool, dark and dry over summer. In October, give them a sunny location in your garden. I pickled my paperwhites with the gin solution — and got fabulous results. My question is now that they’ve finished blooming; can the bulbs be saved for later this year (again). I would, of course, let the green leaves die naturally so the nutrients would go back into the bulb; but would the fact that they were “fed” alcohol” have a detrimental effect ? Hi Elfrieda – So glad to hear the gin solution worked out for you. From what I’ve read, bulbs forced in pebbles and water (or pebbles, water and gin!) are not viable for future bloom. On the other hand, bulbs forced in soil can indeed be planted outdoors. Still, if you take good care of the bulbs, feed them regularly (no more gin at this point), and then plant them out in the garden, who knows? Maybe they will surprise you. my mother got me a paper white kit that has cocopeat, a pot, and bulb. If i want it to actually work and be reusable next year is good old fashion miracle grow and water what i need or do i have to get fancy? Hi Christopher – You can plant the bulbs in cocopeat. If you want to keep them viable for subsequent years, skip the alcohol. It is absolutely essential to keep the plants watered and fed until their green foliage withers. Have fun! Your 40% proof “trick” really has worked for my paper whites. I did a test both ways and sure enough, I have flops and no flops. Even recorded the results and sent pics to my gardening friends. I am a member of an herb society in OH and your “trick” will be included in the monthly newsletter, of course with an attribution to Kevin Lee Jacobs. Thanks so much. Hi Kevin, I put 4 paperwhite bulbs in a tall glass vase with a few glass pebbles. They grew long green leaves but did not bloom. Maybe I didn’t put enough pebbles in the bottom? I take it from your comments that there isn’t much use in keeping them to try again. next time I will have to try your gin recipe. Hi Kathy – You did nothing wrong. Most likely your bulbs were harvested too early by the grower who sold them. The bulbs did not have a chance to produce an embryo flower. My advice? Ask for you money back! I got 4 bulbs..2 for pebbles and 2 for soil. I just need to wait til my husband get me a gin. I have forced 2 paperwhite zivas indoors and 4, I planted in soil and sort of grew them both indoors and outdoors. The two I had forced indoors produced beautiful greens and also two buds. One of them didn’t bloom and died in its bud state. The bulb is still good and still growing green leaves, but the bud, the flower is just dead. The second is getting to that stage, but not yet. The 4 are still growing and doing much better than the other two. How can I save the two bulbs that are dying/dead so that I can regrow them outside? I really love them and took care of them. It’s so heartbreaking that they didn’t bloom. Your help would be much appreciated. Your site is very informative. Came upon your site after wondering if I can force paperwhites again after having them in water.